Did I like The Hobbit? I did. Was the Gollum sequence everything I could have asked for and more? It was! He sang, he talked to himself, I was terrified and delighted all at once! But clocking in at 2 hours and 49 minutes (with, let’s say, an estimated 8 hours total for the trilogy) one can’t help but turn an eye to the ways in which the running time might have been trimmed. And while I’m no filmmaker and certainly wouldn’t presume to know more about what story elements should be cut, I do know THAT ADDING SH*T THAT IS NOT IN THE BOOK WILL NOT HELP YOU COME IN UNDER THREE HOURS. Yeah, sometimes you have to change stuff from book to film. Film is a different medium, yadda yadda yadda. But whereas the changes in the original Lord Of The Rings trilogy had to do with cuts (no time for hippies, Tom Bombadil…lo siento Faramir/Eowyn shippers), Jackson has gone the other way this time. What I’m saying is that he’s delved too greedily and too deep. I’m no Silmarillion-thumping purist, but here are five deviations that rubbed me the wrong way. Caution, 75 year-old spoilers. Azog The Defiler: While it is strictly canon that an orc named Azog fought the dwarves at Khazad-dûm and that he killed Thorin’s grandpa, this pale mother*cker does not feature in The Hobbit. Not even a little bit. There is no “big bad” chasing Bilbo & Co. and, if there were, he certainly could have looked a lot better. An all-CGI character is tricksy to pull off. Doubly so if you don’t have the benefit of having Andy Serkis give it life, give it weight, make it real. No offense to this guy, but I’m not sure a featured role in “Spartacus” prepared him to bring the proper degree of menace to this role. Think of the thundering hooves of the Ringwraiths. Think of the terrifying snarl of the Uruk-hai. Now think of this weightless worm of a creature on his CGI’d Warg. Disappointing. Unnecessary. Presumably we’ll see his pale, non-menacing face again in the second or third film, once things get a little tense between Laketown, dwarves and elves. Thankfully, however, I suspect whatever issues I have with Azog will not carry over to Smaug. In Cumberbatch We Trust. The Galadriel and Gandalf Love Story: Who the what now? I was as happy as anyone else to see Cate Blanchett return. She’s not in the book. That’s fine. But what was THIS? What purpose did it serve? To humanize Gandalf? True, fine, it didn’t take up much time. But it chafed. Radagast The Brown: We don’t have time for Tom Bombadil but we’ll manufacture an entire sequence with some addled, guano-smeared wizard on a rabbit sleigh? Like Azog, Radagast is canon, but plays NO part in “The Hobbit.” Many will say that the sillier tone of the Radagast sequence fits with the child-like nature of “The Hobbit” itself. That thinking got me through the snot and bum jokes in the Troll sequence, but did nothing for me here. Sylvester McCoy did a bang-up job with what he was given, but what he was given was bird crap. And that Warg chase scene with Radagast, the dwarves, Gandalf and Bilbo was some of the sloppiest action I’ve seen in a long while. Harrumph. Amping Up The Role Of Legolas’s Dwarf Racist Party Dad, Thranduil: Okay, first of all, if you don’t know yet, that poncey, bitchy, stag-riding elf who coldly denied the dwarves when they were being slaughtered by Smaug? That’s Legolas’s dad (aka Lee Pace). He’s a party dude and a bit of a racist. He’ll play a bigger part in the next film (along with, one assumes, Evangeline Lilly’s made-up elven warrior princess). The issue with playing up the racism angle is it makes both Thranduil and Thorin look like unreasonable asses. Thorin’s hysterics (and quick reversal) in Rivendell were particularly off-putting. The dwarf/elf racism was played for laughs between Gimli and Legolas in the original trilogy, but making it a serious issue is a mistake. 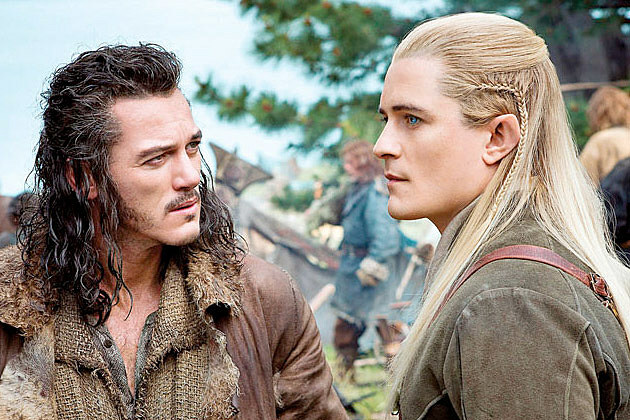 If, however, this is just one big machination to bring back Orlando Bloom, well, then, I’m okay with it. The John McClane-ing Of Bilbo Baggins: “The Hobbit” is, at its core, a very small and simple story. For all the giants and wolves and trolls and goblins and dragons, this is a really story about a comfy little Hobbit who doesn’t really want an adventure. He’s blustered out the door by Gandalf (this plays out a bit differently in the movie where it’s much more Bilbo’s idea) and throughout his journey thinks back longingly on his cozy home. Martin Freeman was perfectly cast. Just perfect. But the bravery that Bilbo eventually shows is a slow to come and hard won. It has a lot more to with the ring and nothing at all to do with charging out of a flaming tree and attacking Orcs and wolves. Bilbo is not an action hero. He’s a sneak. A thief. A clever, tricksy little hobbit who finds his courage when he needs it most. Bilbo is a bit craven, actually. Those shades of grey are lost when you turn him into a fighter. He’s not Frodo, nor would we want him to be. It’s the quiet moments that work the best in this film. Bilbo’s worried conversation with Bofur (the excellent James Nesbitt) or the cannily encouraging words from Gandalf. More of that and fewer sword fights please. This might all sound negative and finicky but I do want to reiterate that I enjoyed the movie. I just think it could have been better with a bit of restraint. I’d like to think that Peter Jackson made The Hobbit into three films because he loves Middle-Earth and couldn’t bear to leave it. The cynic in me thinks it feels like a money grab. Then again, Jackson gave us so much. Haunting dwarfsong, a game of riddles and a Conchord. For that, we thank him.